Start small, start right now. That phrase coming out from Chef Afit and his wife Lucy Wiryono, is probably the best applicable mantra if you’re thinking to start your own food startup. After successfully established Holycow! 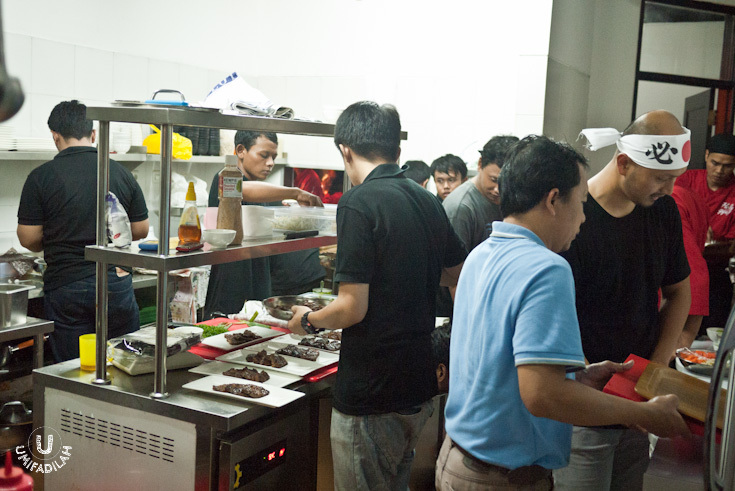 STEAKHOUSE on 2010, Loobie Lobster that was introduced on February 2013 was also becoming quite a phenomenon until now – you will still expect lots of people queueing for both Wagyu & Lobster treats at meal peak-time. If you ever notice the silver lining, it’s probably the fact that every breakthrough is coming from the same concept – “<insert luxury dish here> For Everyone” – yes, it’s always been an affordable luxurious dish concept. Now meet their 3rd brilliant creation: HolyGyu. HolyGyu is a collaboration of Holycow! STEAKHOUSE by Chef Afit with a team of Japanese people that fell in love at the first bite with Afit’s cooking – named Momotaro-san. You can read the full story here and the inspiring story that led it here, written by Lucy herself. 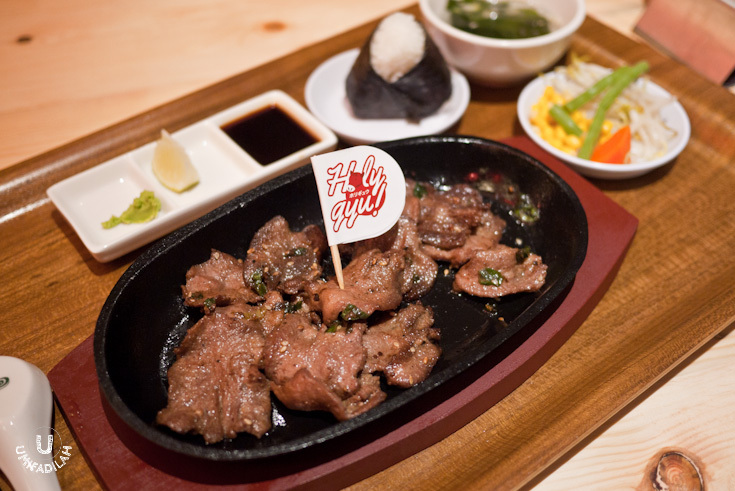 One of the key highlight of the establishment of HolyGyu is that they serve KOBE BEEF. 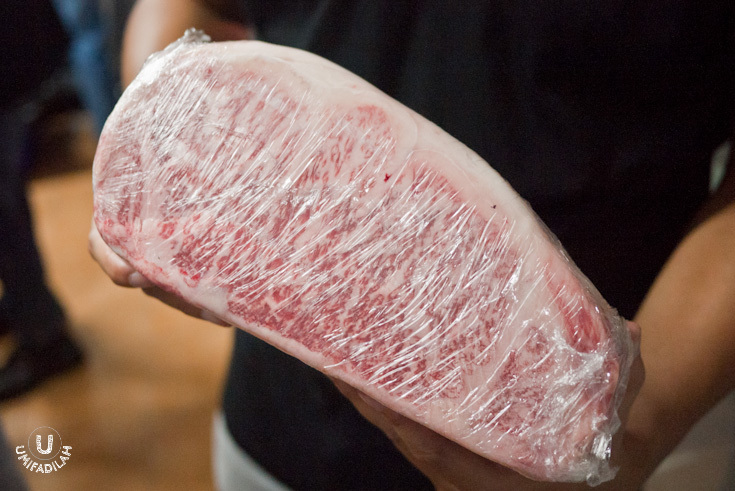 Did you know that in Japan itself a portion of normal grade Kobe Beef would cost around 1 million rupiah? 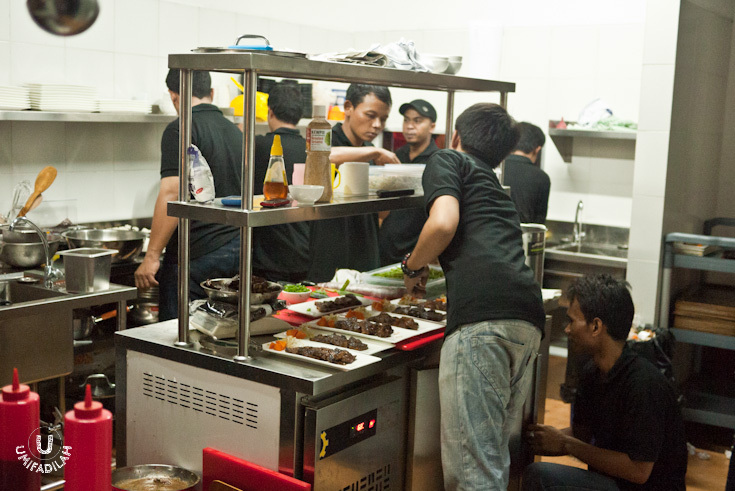 Not forgetting that the sky has no end – the highly marbled Kobe Beef will cost you more than 2 million rupiah! So yes, it’s probably not quite safe to say that Kobe Beef is for everyone, but here at HolyGyu they’re trying their best to give you the cheapest deal anyone in Indonesia could ever get with their Kobe eating experience. 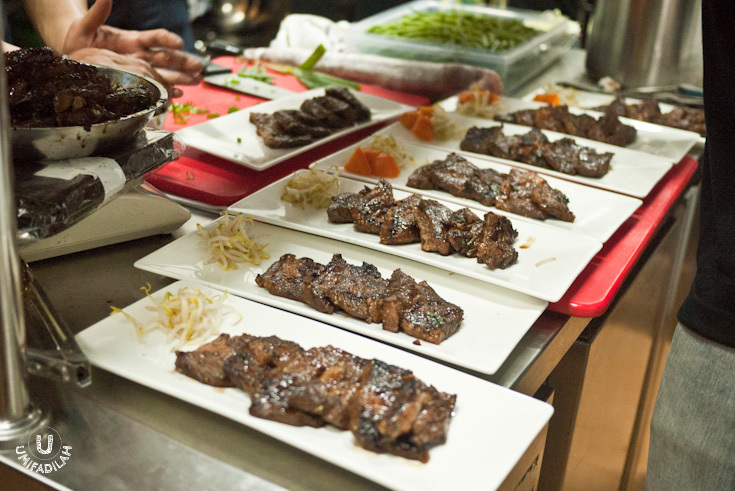 In HolyGyu, 100gr portion of Kobe Beef is sold for IDR 310k, and the 200gr portion costs IDR 520k. So last night was the opening night of HolyGyu. Located at Panglima Polim V, alongside with Loobie Lobster’s 2nd outlet that will open tomorrow 13/10/2013 (also, congrats! Again, smart move.. Don’t you just admire this couple :) - They’re just in front of Mangia and Taco Local so you can’t hardly miss it. Thank God this new establishment of Holygyu has far more spacious room to accommodate more customers, but last night it was totally full on the house. I didn’t know for sure how many were coming, but it has got to be at least 100 people. They held #WasabiWar too as a way to celebrate HolyGyu’s opening night. It went TOTALLY INSANE with the cheering and everything, hahaha. 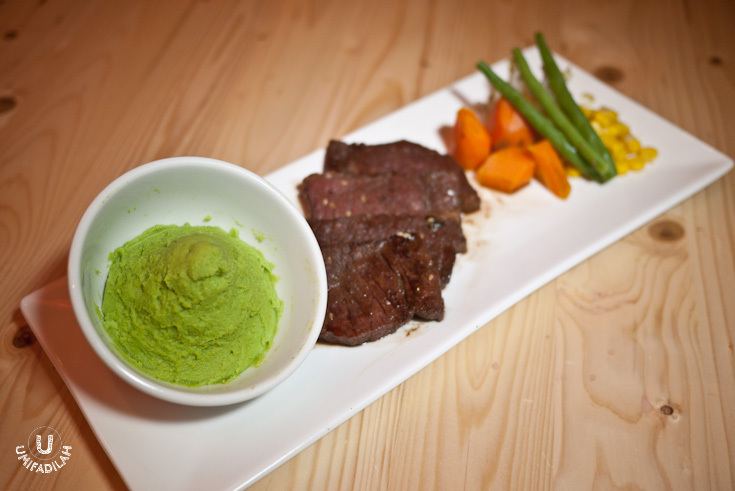 The participants were given a bowl of wasabi and a small plate of steak – whoever finishes first, wins. 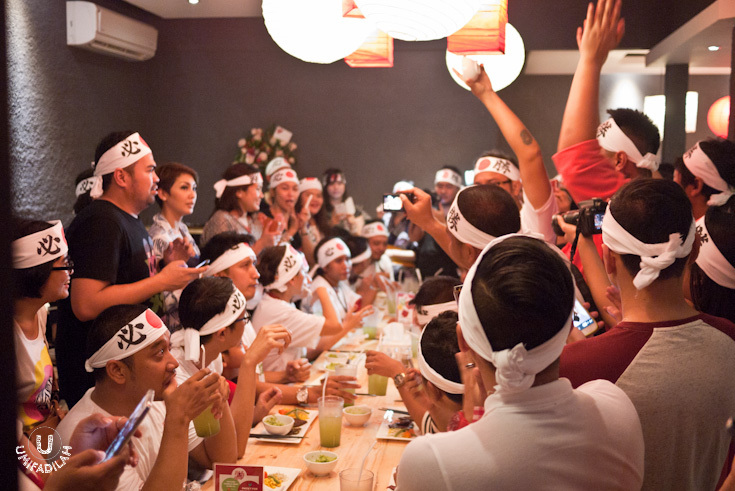 To my surprise the winner was a woman, with record-breaking of cleaning up the entire wasabi bowl in less than 5 seconds! I swear to God the thought of eating a bowl of wasabi never creeps me out like this before, haha. Frantic madness during the #WasabiWar, hahahaha. What they had to eat on #WasabiWar: A rice-bowl full of Wasabi and only 4 steak slices. I will never enter such competition like this. Salute! Had to peek from the cupboard hole located in front of the store because it was very, very crowded. Anyway because it was too crowded (and HOT!) inside, I crawled myself out and had a chance to peek inside their kitchen. That’s where I meet Chef Afit & his executive chef of HolyGyu – and I got to ask them to pose with their baby: The almighty cuts of Kobe beef! If Kobe was a star I’d be a star-struck foodie last night, you know. Chef Afit and his Executive Chef at HolyGyu, holding the almighty Kobe bundle. Kobe Beef. Even when covered with thick plastic wraps, you can peek at its marble can't you? The food menu at HolyGyu is categorized to 4 section: Special Prime Menu (all Kobe and Wagyu 9+ Grade), Wagyu, Prime AUS Beef, and Chicken. But because of the massive crowd last night, we only have 3 menus to choose: Wagyu Tan, Wagyu Shortrib Boneless, and Wagyu Shortrib Bone-in. Well I guess this is definitely my cue to come back for more dishes next week, huh? Wagyu Tan – IDR 125k (200gr) / IDR 90k (100gr). I’m not quite sure if the ‘wagyu’ term had a specific impact to the cow’s body part other than its beef (e.g. 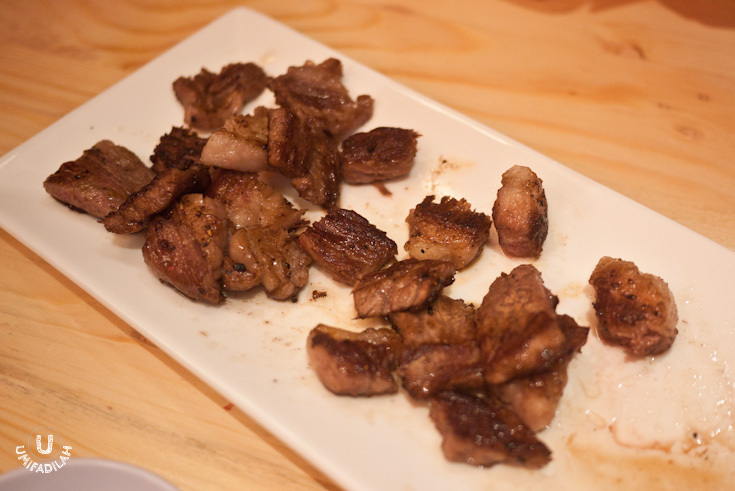 tongue, intestinal innards etc), but this Wagyu tan (beef tongue) was tender enough and not chewy at all. It was thinly sliced and seasoned with strong Japanese flavor, I saw sesame and slices of greens (maybe) negi. Served on a hotplate with onigiri, wakame soup, Tsuke Dare sauce with lemon and wasabi, and veggies on the side. The best way of eating this is to apply a dash of wasabi directly onto the thin slices, then roll’em up before dipping it to the sauce. Don’t forget to hold the onigiri on your other hand! Wagyu Short Rib Bone-in – IDR 100k (200gr) / IDR 80k (100gr). The 200gr portion was quite fulfilling. True, it has bones, but there were also lean and thick cuts that’s just remarkably juicy and well-seasoned. We did give feedback that we needed cutleries such as knife and fork, because it’s almost impossible to finish them clean using only chopsticks. Well you can always do it my way, by using bare hands, because it’s fingerlickingly good! Wagyu Short Rib Boneless – IDR 142k (200gr) / IDR 100k (100gr). This was, wow. I mean, did you see those layers of fat? It was juicy, succulent, and if you cut right through you can still see some pink flesh of the fresh meat. Honestly when the waitress came in, he didn’t ask us whether we wants it to be rare/medium/well-done; but when this adorable-looking steak came, I didn’t file a single complaint. They know what’s best. And I couldn’t be happier. Kobe Beef chunks seasoned only with salt and pepper. It was slightly a bit overdone to my liking (for Kobe beef I like them to be medium rare :D), but the quality of the ingredient speaks for itself. Super juicy and buttery it literally melts in your mouth. There’s a certain pleasure of photographing with you being busy holding out on your saliva – the fact that you just wanna get over it so soon and tuck into the actual eating. Oooh how I will be back for you, Kobe. About the sauce, HolyGyu serves 3 kinds of sauce (you don’t get to choose, you get ALL of them): Tsuke Dare sauce, Lemon Sauce, and Goma Sauce. But last night I didn’t have the chance to sample the Goma sauce, so let’s save it for another round. This review of HolyGyu is not yet done until I order a plate of their 200gr Kobe Beef myself. That being said, I guess I’ll write to you again somewhere in the near future. 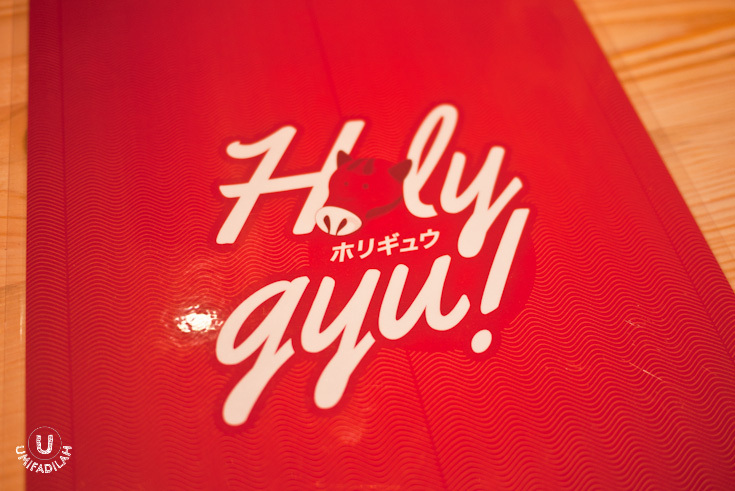 FYI, HolyGyu postponed their opening date, so it will open for public next Wednesday, 16 October 2013. If you’re curious, go for it and be one of the first!